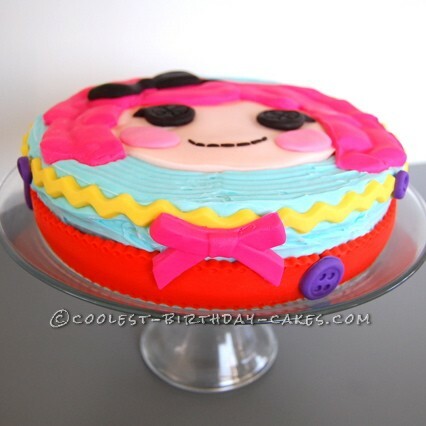 Let me just say that I didn’t even really have a plan for this LaLaLoopsy cake. 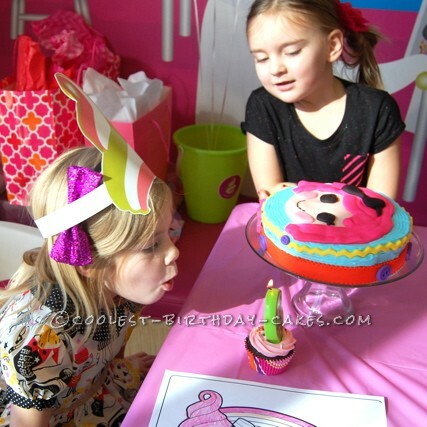 The only request my daughter had for this cake was to have it look like a large LaLaLoopsy head. And up until the night before the party, I really had no idea how I was going to do that. So this cake was an experiment that with a little luck ended up looking pretty okay! I made a cake in a round 8″ pan and frosted it with regular blue buttercream frosting. And then I got to work with the fondant. This part always scares me (and maybe fondant intimidates you, too) but working with fondant is a lot like playing with play-doh. 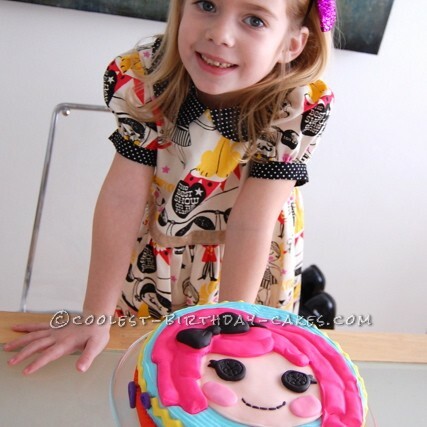 I used Wilton fondant in Natural Colors and Neon Colors multi-packs for the LaLaLoopsy head, hair and facial features. 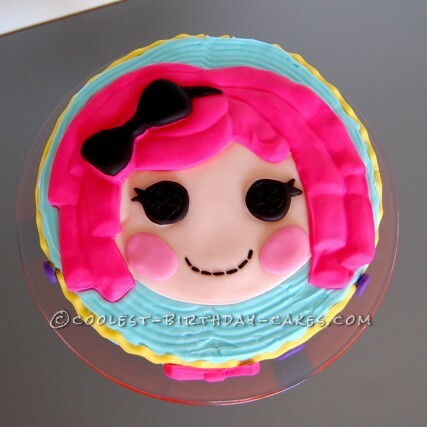 With some patience and a LaLaLoopsy doll sitting next to me on the kitchen counter for reference, I cut and molded the shapes I needed and pieced them together on top of the blue buttercream. When the face was done, I used a Wilton Fabric Fondant and Gum Paste Mold to make the ribbon, rick-rack and button trim for sides this cake. 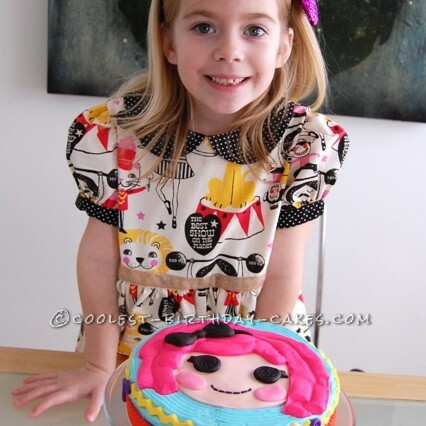 Each seam in the ‘ribbon’ trim was covered by a fondant button. 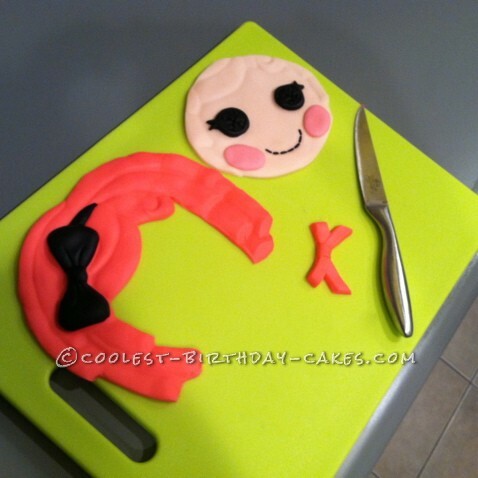 Birthday cake idea Posted by Jen G.
Hi! 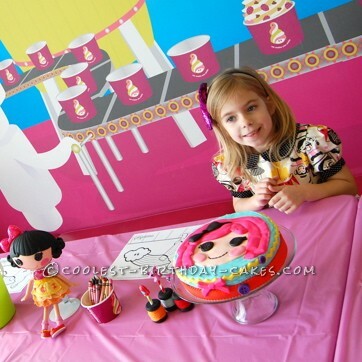 The idea of doing a Lalaloopsy cake occurred to me the other day because she’s so darn cute! I have done the Foofa cake for when my daughter was three and then a rainbow cake and some others but the Loopsy is adorable. I saw some folks who actually created the entire doll but I’m with you I like the head only – and the pink haired one is my fav. I’m going to show this to my soon-to-be 6 year old when I pick her up from school and if she agrees I’m going to attempt making this. I have *never* used fondant before but I’m crazy about making custom cakes. So I’m willing to give it a try thank you for the specifics on what you used and brands, etc. Looks super great to me!